The American Eskimo Dog is a gorgeous white dog that comes in three varieties, toy, miniature and standard. The Eskie's plumed tail rests curled over its back. The muzzle is wedge shaped, and it has a kind of mane around its neck. The Eskie is an excellent dog for families with children. 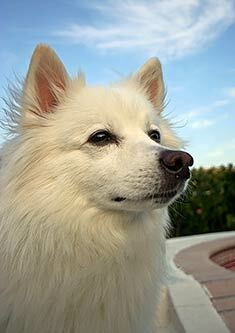 Originally from the Nordic countries but officially recognized as the American Eskimo Dog in the US. The American Eskimo Dog's coat is always white, or white with biscuit or cream markings. The Eskie's thick coat should be brushed twice a week, and daily when shedding. This breed is an average shedder. Highly intelligent and very trainable, American Eskimo dogs will be weary of strangers until introduced. Affectionate, Eskies will bark and needs firm handling. 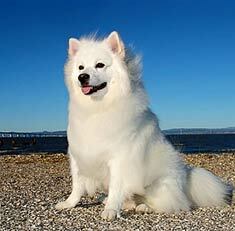 Loyal and energetic, American Eskimo dogs must be thoroughly socialized when young. Attention should be paid to the Eskie's eyes and tear ducts, also the coat should be flea free which could otherwise cause dermatitis. The American Eskimo Dog can be expected to live about 15 years. The American Eskimo Dog loves to be taken for walks and should be done so on a leash. This breed will do well in an apartment. The American Eskimo Dog is in the Non-Sporting Group. Descended from the Spitz dogs of Japan and Germany, the American Eskimo is cousin to the Malamute, Elkhound, Keeshond, Samoyed, Husky, Akita, Chow Chow, and Shiba Inu. You can recognize these breeds by their similarity to their wolf ancestors, with the tail that curls up over the back. The dog’s body is just about square, with his length just a bit more than his height at the withers (shoulders). The muzzle is long, and the ears stand upright in a triangular shape. They have thick white or white and cream double coats that blow seasonally, creating a huge mess for the short duration of the blow. The undercoat is soft and helps to insulate the dog from the cold, while the harsh outer coat repels wet weather. The coat gets very thick and long around the neck, forming a ruff that looks a bit like a lion’s mane. The breed standard calls for three different size classes. The toy stands 9 – 13 inches tall and weighs 6 – 10 pounds. The miniature stands 12 – 16 inches and weighs 10 – 20 pounds. The full-size Eskie stands 16 – 21 inches and weighs between 18 and 35 pounds. Are American Eskimo Dogs easy to train? The American Eskimo was bred to be a family companion, as well as to do the heavy work required on Nordic farms. This background reflects a highly intelligent dog who is trainable. They are fairly independent, which requires that you establish yourself as the alpha dog early in the relationship. This is a dog that has a long puppy-hood, and new owners should be prepared to deal with the annoyances of a young dog for at least 18 – 24 months. As noted above, the Eskie is very intelligent, and it is this intelligence that often causes problems. As an Eskie parent, you must be prepared to keep the dog mentally stimulated. Kong toys, where the dog is required to figure out how to get the treat out of the toy, offer a good way to keep the dog thinking rather than acting out. Do Eskies make good watchdogs? The American Eskimo is protective of home and family, but doesn’t generally threaten to attack or bite anyone without provocation. The breed is known to bark at strangers, so he will make a good watchdog. The barking may become problematic if the dog suffers from separation anxiety, which is common in this breed. This breed lives, on average, 12 – 14 years, but some of them actually live as long as 20 years. Adoptive parents should be prepared to make a long-term commitment before choosing this breed. American Eskimo puppies are extremely cute, little white balls of fluff. It is easy to get sucked into purchasing one without fully considering the long-term ramifications of the deal. Genetic diseases do occur rarely in this breed. The smaller dogs may be subject to luxating patella, where the kneecap slides out of position, while the larger dogs may suffer from hip dysplasia. As you look for a breeder, you should ask if both parents are certified as free from these diseases by the Orthopedic Foundation for Animals. In addition, breeding stock should be certified by the Canine Eye Registration Foundation as being free from genetic eye diseases like Progressive Retinal Atrophy. The last health concern is not terribly debilitating, but does detract from the good looks of the breed. These dogs are prone to allergies, and because of their white faces, tear staining can become a problem. Because many allergies are inherited, take a close look at the faces of the dam and sire of the puppy you are considering purchasing. Look for dark streaks running down from the inside corners of the eyes. If your dog does develop allergies, you can gently wipe his face with a warm washcloth to remove the stains. Will I need to do a lot of grooming? The American Eskimo dog, as its name suggests, does best in cold climates. However, he can survive just fine in the heat, and should never be shaved. His dense double coat will actually protect him from becoming overheated. The dense fur must be brushed at least once a week, probably more often. During seasonal coat blows in late spring and fall, it really doesn’t matter how much you brush, you can’t keep up. Using an undercoat rake can help, but you will just need to accept that you will be finding clumps of fur everywhere you look for a week or two. Don’t plan on just leaving your dog outdoors during the blow. Although they enjoy outdoor activities, the Eskie is a very social dog and wants to be near his family. They do need a lot of activity as an outlet for their high energy. Long daily walks or free play in a fenced yard is absolutely required. What will the American Eskimo think of my kids and other pets? The Eskie is very playful and affectionate. He is an excellent dog for families with children because he wants lots of love and attention. Early socialization will keep your dog from becoming aggressive with other dogs. Introduce him early to training, perhaps via a puppy class that is primarily concerned with socialization. The Eskie will consider small animals such as birds and rodents to be prey. Care should be taken if you own small pets that they do not become hors d’ouevres for the dog. These dogs make great companions and family dogs, but you must be prepared for their long puppy-hood and excessive seasonal shedding. If you have a high-energy lifestyle to keep your dog mentally and physically stimulated, this may well be the dog for you! Find American Eskimo Dog Puppies with our Free Breeder search!